Andre Norton (Alice Mary Norton, 1912-2005), “the Grand Dame of science-fiction”, was one of the first authors of Young Adult s-f, and of anthro s-f. At a time when most s-f featured teenage or adult human heroes fighting alien adversaries, her novels often starred humans working with sympathetic anthro aliens against human villains, anthro protagonists, or humans transformed into anthro aliens. Today, Baen Books is reprinting many of her out-of-print s-f titles, two novels in each book. The Iron Breed reprints two of her anthro classics together for the first time: Iron Cage (Viking Press, September 1974; original cover by Bruce Waldman) and Breed to Come (Viking Press, June 1972; original cover by László Gál). If you have not read them before, read them now. Baen Books, January 2013, trade paperback $12 (448 pages), Kindle $8.99 (preview). Well, Iron Cage (pages 1–220) is not exactly an anthro classic. The protagonist is Jony, a human young adult with a mutant mental talent somewhere between super-empathy and mind control. Jony is introduced as a seven-year-old. He and his mother Rutee have been captured on their colony planet by wandering aliens. In the brilliant sunlight the patchy coloring of the People’s fur, which gave them such good concealment in the brush, looked ragged. There was no pattern to the splotches of light and dark which dappled their stocky bodies. The fur of all patches was a green-yellow but in such a diversity of shades as to make their outlines almost indiscernible even here in the open. Only on their round heads was the color laid in an even design of light on the muzzle, dark about their large eyes. Jony and the twins were not so well provided with body covering, to his resentment and disgust. He did wear a kilt of drab, coarse stuff which was dabbled with berry and vine juice to resemble the People’s shading. But, compared to the soft fur of his companions, he considered it highly inadequate, which it was. Maba’s and Geogee’s wanderings off get them trapped in ominous underground chambers with dusty pictures of spacefaring humans and old but still deadly futuristic weapons in them. When Jony rescues them and brings them back to the People, the bearlike natives become hostile and distraught, imprisoning him and taking him far from their ancestral homeland. Jony is abandoned into a lone exile. When a human spaceship comes to trap and exploit the People like dumb animals, Jony must figure out the true relationship between the humans, the Big One aliens that had captured him and Rutee on another world, and the People. He must decide whether to join his own kind, or fight for his adoptive community despite their having turned against him. Iron Cage is a good read, but the bearlike People are only intriguing anthropomorphic background characters. Iron Cage is Jony’s adventure, and he is human. 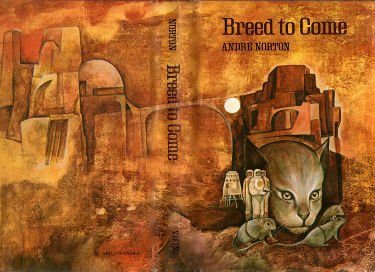 Breed to Come (pages 221-442), on the other paw, is a true anthropomorphic classic. 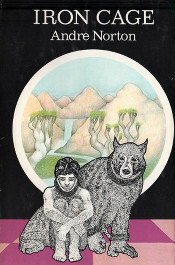 It is arguably the earliest s-f novel to feature an evolved animal-man protagonist, as opposed to a fantasy novel with intelligent animal characters. 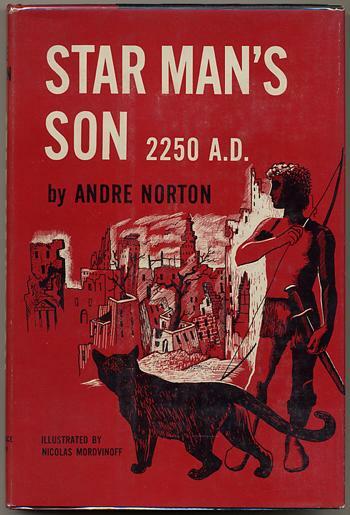 (Norton used a very similar plot in Star Man’s Son, 2250 A.D. (Harcourt, Brace, August 1952), reprinted as Daybreak – 2250 A.D., but that featured a mutant human protagonist in a world of intelligent animals.) In the far future, humanity has become insanely reckless and, due to a deadly experimental “epidemic virus”, the humans have abandoned Earth. That same virus has caused the housecats, dogs, and rats left behind to evolve extremely rapidly into intelligent People (cats), Barkers, Tusked Ones (boars), and Rattons, each achieving a primitive civilization while the three fight over the relics of their “Demon” forerunners. In fact, Furtig learns, the absent Gammage had believed that the Demons would return. Furtig journeys to find Gammage and learn the truth. He finds things to be more ominous than he feared. Not only is Gammage convinced that the Demons will return to Earth soon, the Rattons are attacking to gain control of the Demon relics that Gammage planned to use against them, but which the Rattons plan to use to make themselves masters of the People and the Barkers. Furtig is sent on missions with others of Gammage’s group against the Rattons and to beat them to new Demon artifacts. When the Demons return, Furtig is in the forefront of the fight against them, though they are not what the People expect. Breed to Come is a bit old-fashioned by modern standards, but still a must-read for today’s furry fans. If you don’t want to spend $12 for The Iron Breed, look for it or for the original 1972 edition of Breed to Come at your public library. 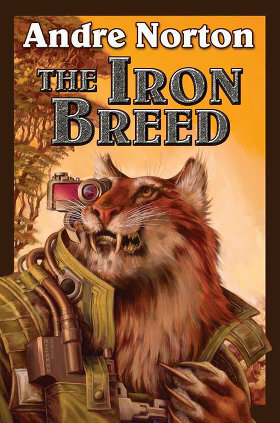 The cover art for The Iron Breed by Stephen Hickman is new. Hickman is a fine s-f artist and this is a fine painting of a felinoid Furry cat-man; but it is generic s-f art, not illustrating any particular scene in this book. If you want to see the original cover of "Star Man's Son, 2250 A.D.", here it is. Cover and interior illustrations by Nicholas Mordvinoff.